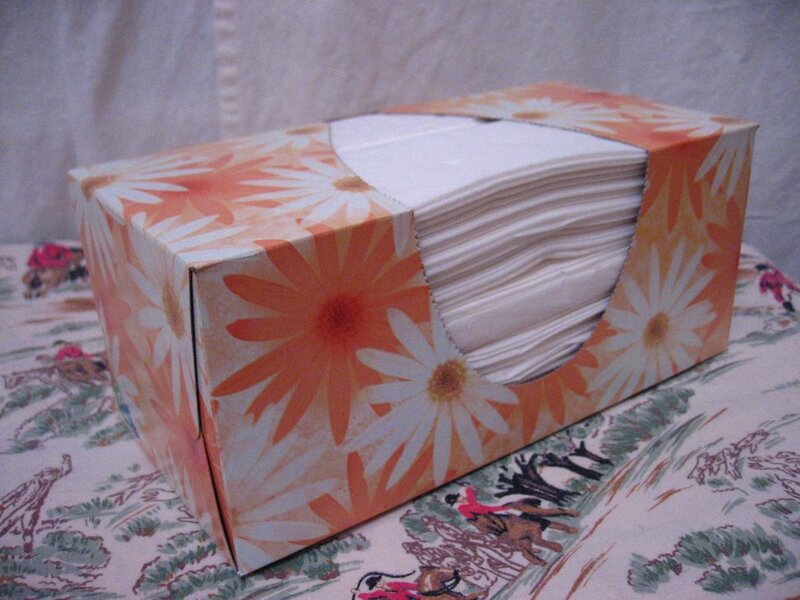 Just bought this box of tissues. After I opened the box, I saw that the top tissues were slightly dented. I would return the tissues for a refund, but I can't because I've misplaced the receipt. This is just one more example of Proctor & Gamble interfering with my peace of mind. Other examples, as you may recall, include the 1987 Pringles Cheese-Ums Recall, the flightless nature of Always Maxi-Pads with Wings, and the federal law prohibiting private ownership of bald eagle feathers without a permit. Well, at least they didn't cause all the wars in history, Esther. Fair's fair - you have to give them that. It's just Proctor. Gamble is the good egg. Known them since childhood. hehehe..now i've got this odd picture in my head of someone blowing his nose with bent tissue. Burn them in the street middle-East style, spraying the air with machine gun fire. Do you have any costume tips? You didn't misplace the receipt. It was P&G's CEO that took it. That's right: Satan. Even now he sits on his murky hot throne, well, blowing his nose actually...it's flu season down there and, even with the dent, those darn kleenexes are soooooooo soft, so soft and fit for a dark lord. Do you ever remember what happened to the haired eagle feathers law? Did that get repealed? This reminds me of the time we had to call the Cracker Jack company to call them out on the peanuts they WEREN'T putting in the box. It's all about quality people. All about quality.